This is the first time our Woman Warrior workshops are coming to Virginia! Join us for only one or both Woman Warrior workshops in this beautiful and deeply healing series of yoga for sexual assault. 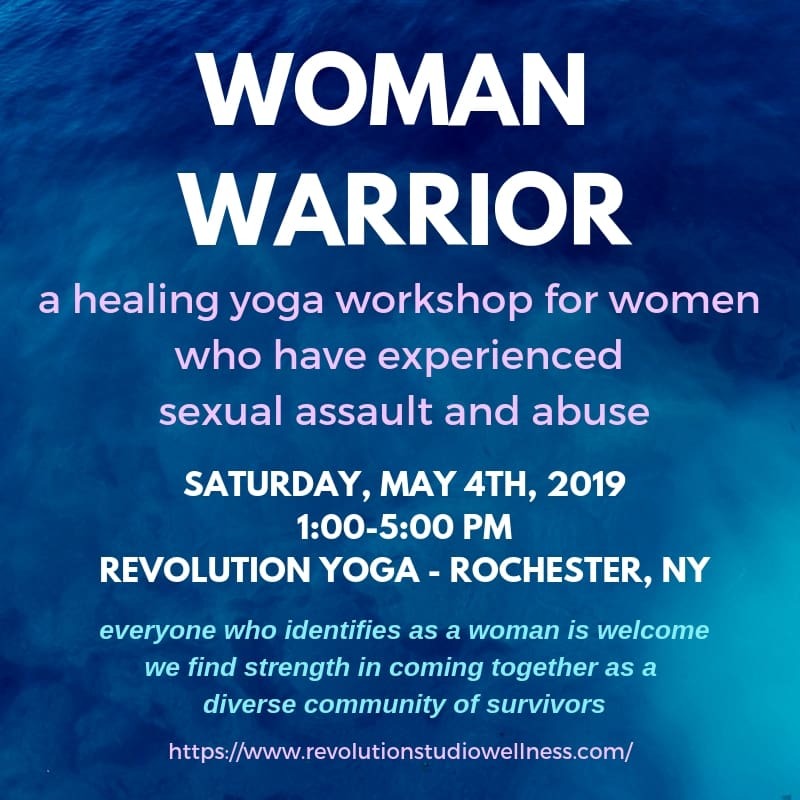 Join us in my home town of Rochester, New York for a very special Woman Warrior workshop hosted by the amazing team at Revolution Yoga. This is our first Woman Warrior workshop in upstate New York! This online workshop for survivors will support you in breaking through any mental, physical, or emotional blocks you've been experiencing. You'll have the opportunity to share in yoga movement, meditation, and relaxation. Everyone who is welcome and no yoga experience is necessary -- we value coming together as a diverse community of survivors. Join this online workshop through your phone, computer, or tablet by downloading the FreeConferenceCall app. Healing Yoga for Sexual Assault Survivors - Washington, D.C. This gorgeous series will help you dive deep into your own healing process, with the love and support of our D.C. Woman Warrior community. Please email for scholarship info. Join us for only one or both Woman Warrior workshops in this beautiful and deeply healing workshop for sexual assault survivors. Woman Warrior workshops provide a gentle and powerful healing space for women who have experienced sexual trauma. These workshops are a place for you to feel safe and secure as you move forward in your healing journey. Led by survivor and activist Halli Jastaran Faulkner, Woman Warrior workshops use the tools of movement, breath, and mantra to tap into your own healing power. Woman Warrior workshops welcome all women who have experienced sexual trauma. Everyone who identifies as a woman is welcome - we find strength in coming together as a diverse group of survivors. No yoga/meditation experience is necessary - all that's necessary is an open heart. Each workshop includes breath work, yoga movement, rest, relaxation and group meditation. Some of this meditation will be silent, and some will use chanting or mantra. Although we sometimes share our experiences by talking with each other, no one is ever required to speak or share during class - the most powerful moments of connection are often found in silence. Workshop themes include grounding, centering, pleasure, prosperity, joy, abundance, deservedness, balance, and well-being. Please join us. It's time to take back our lives.